Veldez, a blog, is layman literature which includes observations about family life, vocation, books, music, the outdoors, and life as it is. Written from the perspective of a thirty-something husband and father of six, a Christian worldview is the common thread throughout. The best thing about blogging is the community… meeting new people and sharing ideas. Thanks for visiting my page. P.S. is that a fly-rod in your backpack? I second that about community and the exchange of ideas. Very enjoyable. And the rod is an Eagle Claw fly/spin combo pretty appropriate for hiking being that breaks down into four pieces. I am learning to fly fish and hope to get better at it. 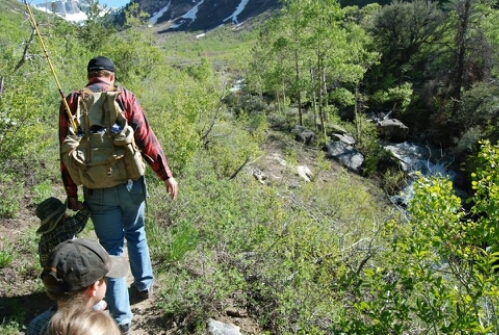 Nevada’s Ruby Mountains have ample alpine lakes and streams to make the learning that much more enjoyable. Here’s to more blogging, Moleskines, and fishing! I got a fly rod for Christmas, don’t know the first thing about it but anxious to try. Sounds like you live in a nice area! I don’t know much either but keep sharp pointy objects away from one’s self at all costs! Nevada has some good places if you can get past the casinos and get away for a while. Aye, Vegas is another world all on its own. We used to live up in Washington state near the border just shy of Osoyoos, B.C. The last time we visited Canada I almost had to fill out immigration papers to get back into the Red, White and Blue. The trouble was worth the anniversary date my wife and I had at a Greek restaurant in Penticton.